3D Product Design – Mold Vision Inc. 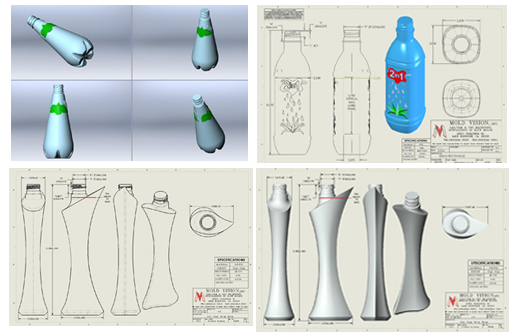 MOLD VISION, INC. TAKES YOUR IDEAS AND IMAGINATION TURNS THEM IN TO 3D SOLID PRODUCT DESIGN. Our design engineers have vast experience in designing many different types of products and are capable of taking your ideas and imaginations to a complete 3 dimensional product design. We use Solid Works Mechanical design software to design and enhance the product design. When the design is completed, we can email the product design to our customer in an e-file format. The customer is then able to view and simulate the product design at his or her own desktop. This allows the customer to make any design changes required right from their desktop and relate back to us. Mold Vision, Inc. has multiple work stations licensed with Solid Works readily available.